After a pathogen infects the body, the immune system responds with a remarkable—and remarkably complicated—cascade of events. Some immune cells, called lymphocytes, migrate to the site of infection; others migrate to areas of the lymph node where antibody production can begin. Profuse signaling among immune cells takes place, through both cell-to-cell contact and release of signaling molecules. The goals of these responses are destruction of the pathogen and repair of tissue injury. During the response, many immune cells undergo maturation into cells with enhanced functions that enable them to respond to particular types of pathogens in specific ways. This is called "effector cell differentiation." For one type of immune cell, called T follicular helper cells, understanding the mechanism of effector cell differentiation could be key to producing better vaccines; helping clinicians fight difficult viral, bacterial or multicellular pathogens; or understanding how to dampen autoimmune diseases. In a paper published in the journal Science, University of Alabama at Birmingham researchers and colleagues at four other United States institutions have detailed a mechanism that sets the stage for the fate decision that gives rise to two major subsets of effector cells: T follicular helper cells and non-T follicular helper cells, known as Tfh and non-Tfh cells. Both types of cells develop from naïve T cells that express the surface marker CD4 in the lymph nodes. When activation signals announce an infection elsewhere in the body, the naïve T cells are induced to develop into Tfh cells or into one of three types of non-Tfh cells—Th1, Th2 or Th17 cells. Tfh cells migrate to the B-cell zones of lymph nodes, where they interact with B cells to create germinal centers; there the B cells produce and release high-affinity antibodies that specifically target the pathogen. Antibody production is one arm of adaptive immunity, and begins only after several days, or sometimes after a delay of weeks. Non-Tfh cells, on the other hand, migrate to the site of entry of a pathogen in non-lymphoid tissues, where they orchestrate the other arm of adaptive immunity—the enhanced function of innate immune cells. During the early events of effector cell differentiation, it was known that a subset of the activated CD4+ T cells started to produce the cell-signaling cytokine interleukin-2, or IL-2. But researchers had no markers to tell which of the activated cells were producing IL-2, nor could they tell which would become Tfh cells and which would become non-Tfh cells. This changed when members of the laboratory of Casey Weaver, M.D., the Wyatt and Susan Haskell Professor of Medical Excellence in Pathology at UAB, genetically engineered IL-2 reporter mice. These mice had a gene for green fluorescent protein linked to the IL-2 gene. As soon as an activated T cell began to produce IL-2, the cell would glow green when exposed to blue light. This allowed automated sorting of IL-2-producing and IL-2-non-producing cells into two distinct groups. Up until the development of these reporter mice, the Tfh and non-Tfh cells could be distinguished only two to three days after activation. Using the reporter mice, Colleen Winstead, Ph.D., a UAB postdoctoral fellow, and co-first author Daniel DiToro, Ph.D., an M.D.-Ph.D. student in the UAB Medical Scientist Training Program, were able to distinguish the IL-2 producers and non-producers and sort them within hours of activation. Testing of each group of sorted cells showed that they induced divergent sets of genes. The IL-2-producing T cells induced genes known to be important in Tfh cell development and function. In contrast, the IL-2-non-producing T cells induced genes characteristic of non-Tfh effector cell differentiation. This suggested that IL-2 producers were fated to become Tfh cells, and IL-2 non-producers were fated to become non-Tfh effector cells. This fate determination appeared to be set within hours, even before cell division of the activated T cells had begun. DiToro, Winstead and colleagues in the UAB Department of Pathology; Emory University; HudsonAlpha Institute for Biotechnology, Huntsville, Alabama; Massachusetts General Hospital and Harvard Medical School; and Cincinnati Children's Hospital used a second reporter mouse engineered in the Weaver lab to prove this fate determination. The second reporter gene, also linked to the IL-2 gene, created a cell surface marker on the IL-2-producing T cells. When IL-2-producing cells were selectively removed using an antibody directed against the cell surface marker, no Tfh cells were produced—only non-Tfh cells were left. The researchers, led by Weaver, also ran a series of experiments to reveal the mechanics that control this early bifurcation of CD4+ T cells into Tfh and non-Tfh effectors. They showed that the percentage of Tfh cells correlated with the amount of antigen used to activate the naïve CD4+ T cells, and the percentage also correlated with the strength with which the antigen bound to antigen receptors of the naïve T cells. IL-2 production was limited to the cells receiving the strongest T-cell receptor signals. "So, it depends on the strength of activation and the strength of signaling," DiToro said. "Having learned what goes into the development of Tfh cells, now we can manipulate these powerful cells that are required by B cells to drive production of high-affinity antibodies." The research team also found that the IL-2 production by cells fated to become Tfh cells acted on the non-IL-2-producing cells through up-regulation of a high-affinity component of the IL-2 receptor, and that, in turn, induced genes for differentiation into non-Tfh effector cells. Thus, IL-2 acted in a paracrine manner, meaning it acts in a hormone-like fashion on other cells in the vicinity of cells secreting it. The IL-2 producers were affecting nearby IL-2 non-producers. One of the genes up-regulated in the IL-2 producing cells was Bcl6, which is important for Tfh cell development. Development of the three types of T helper cells, collectively known as non-Tfh cells, occurs at the same time as Tfh cell development, so the researchers looked at those fate determinations as well. Helper cells are important in adaptive immunity to help suppress or regulate immune responses. The three types respond to three different groups of pathogens—intracellular single-celled, viral or bacterial pathogens for Th1; multi-celled organisms like worms for Th2; and extra-cellular single-celled pathogens like E. coli for Th17. The researchers stimulated naïve CD4+ T cells in conditions designed to drive Th1, Th2 or Th17 development. They found that IL-2 production and Bcl6 mirrored one another under each of these non-Tfh conditions. They then used multiple in vivo inflammatory models to confirm that IL-2 producing cells develop into Tfh, regardless of the inflammatory context. This has led the researchers to a prediction for another subset of T effector cells called memory cells. Memory T cells are long-lived cells that previously responded to an infection; they can quickly reproduce after a subsequent infection to produce a faster and stronger immune response. The researchers predict that IL-2 non-producers are fated for effector memory T cells, whereas IL-2 producers are fated for central memory T cells. 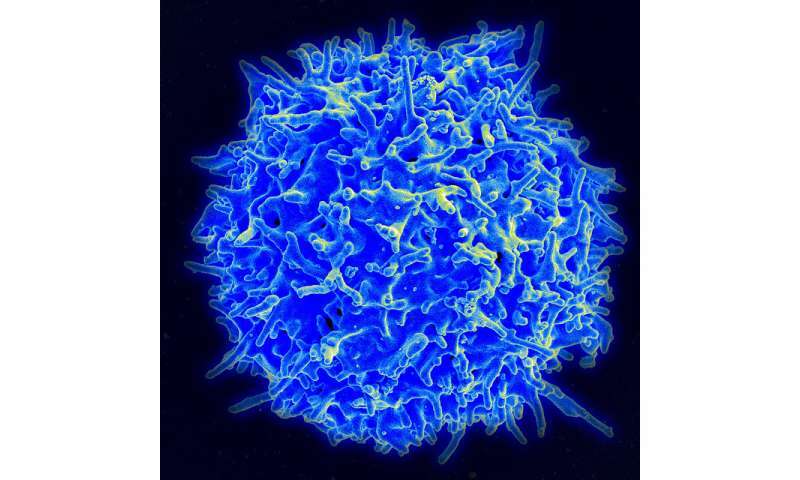 Central memory T cells are found largely in the lymph nodes; effector memory T cells lack the ability to home to lymph nodes, and they stay in peripheral blood and tissues. "The utility of IL-2 as an early marker for cells fated to these different effector programs is established herein," the researchers wrote in conclusion. "We propose that this should provide a basis for strategies to modulate the balance of effector T cell responses for therapeutic ends."